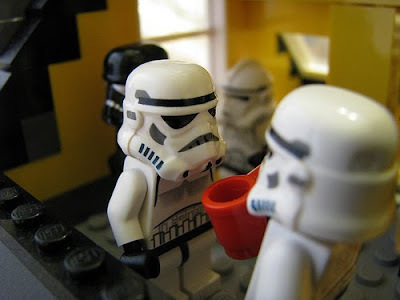 I've never considered a LEGO-themed party, but I bet that enthusiasts and regular folk alike, might cotton to the idea. The food would be easy and merely shaped differently from standard party fare. We could feature cocktails with LEGO ice cubes and cookies made in the shape of 2x2 bricks, thanks to the LEGO cookie cutter. After cookies and an open bar, everything seems better. But the real attraction (for me) would be a free play area with bowls of bricks -- imagine the center of a LEGO retail store or the piles before a parts draft for a LEGO Users Group (LUG). I'd also like the idea of a LEGO Board Gallery to display everybody's creations -- like the one on display at Gizmodo's Private Preview last night. Anybody ever put one together? Did you invite civilians and AFOLs alike?